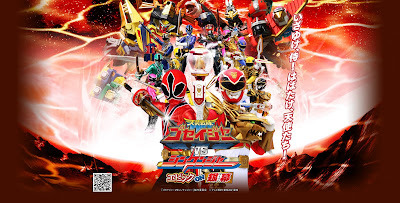 This morning, Grown Ups in Spandex or GUIS, surprises us with a very awesome release of the Super Sentai VS movie Tensou Sentai Goseiger vs Shinkenger: EPIC on Ginmaku subbed in Blu-Ray formats, both in HD and SD. An Ayakashi named Madakodama makes an appearance in the city and starts attacking, until Arata comes in and fights him as GoseiRed. However, his Tensou-jutsu had no effects on it. That's when ShinkenRed appeared. In order to cut open the Sanzu no Kawa, Madakodama retreated. How did the Gedoushu got revived? i seem to have a problem playing its sub. anyone have a solution to that? does guis sub require special codec? Download the latest version of CCCP (combined community codec pack). If it still won't work, your computer can't possibly handle HD.